Professor Victoria Tischler with a personal response to Brexit, and a dance collaboration. Since 7:20 am on the 24th June 2016 I haven’t felt well. It started with a dull ache, deep down in the gut, travelling outwards to the limbs, like a touch of paralysis, then back to the heart centre, beating faster, shallow breathing, quickened. I’m borderline hysterical. Back and forth, in and out, on and on. I feel sick. Never ceasing. Then the psychical ache began, a relentless torment, fed by the barrage of digital news and mass hysteria. I’m afraid: for me, for you, for us. We won, you lost. Get over it. Brexit means Brexit. That idiotic mantra. We love EU, we love EU not. The relationship has run its course. Time to divorce. Painful now but you’ll get over it. Sovereignty. We want a better deal for our fisherman. We Brits are strong and stable. We rule the waves. We march in synch, we wait in line, we queue brilliantly. It's revolutionary. Its mass hysteria. It’s tribal now innit? The cosmopolitan elite. It’s a response to globalisation and neo-liberalism. We’re taking back control snowflake. We’re post-post modern. Like the good old days. It’s the revenge of the ordinary folk, good people, working British families. Let's put them first. British values. Sovereignty. Young and old, black, white and brown. Big Society. Don’t trust the experts, it's patronising elitist hysteria. They’re worried about losing their big fat grants from the EU. We’re not all equal. Are you in or are you out? Quit the uncertainty. Take back control. Remoaners. Bregreters. Get over it. Get on with it. The exit is that way. It's one way. Rule Britannia. Brexit means Brexit. Hate crime. Xenophobia. A rise in mental health problems. They’re taking our jobs, our school places, using up NHS resources. It has been very intense after the referendum with people saying ‘go back to your own country’. A lot of people hate my family because I’m Polish, I get bullied at school. Order another drink or leave. On the underground I look about furtively. Partly a long-standing fear of being underground but I’m also constantly alert to danger. My heart rate quickens. Who to trust? Do not make eye contact. Speak English. I don’t recognise this place. ‘Speak English’ a 24 year old was told as she was pulled around the carriage by her hair on a Central line train. 3:45 am Liverpool St to Stratford. It’s my line. Are you sure? Its fake news, don’t believe it. What do I believe? Are you even British? Then prove it. Article 50, tic, tic, tock. It's just cheap-seat hysteria. Countdown to Brexit. Brexit means Brexit. Strong and stable. Don't believe the hype. Don’t believe experts. It’s a conspiracy. I feel sick. Don’t believe the news, it's fake. Calm down. Believe me. I’m the authority. It's just post-referendum hysteria. Brexit means Brexit. I’m in denial. The more I repeat it, the more you’ll remember. I feel numb. You will accept it snowflake, you just don’t know it yet. It hurts now but you’ll get over it, like any traumatic event. How do you feel now? Thumbs up? Moving towards acceptance? I’m not sure. Uncertainty is worse than something bad happening. It’s proven. Or is it fake news? You will move on Remoaner. I feel ill. I don’t want to get over it. I don’t recognise this place. Brexit means Brexit. It's traumatic but you’ll recover. Turn off the news. Start walking, start talking. Watch carefully. Notice. Even if you disagree with someone, talk to them. More importantly listen. Move 2 millimetres forward. Be kind. Be empathic. Take time out. Look to the sky. Focus on your breathing, breathe deeply. "I presented this piece at the symposium 'After Affects' last month. It combines reflections on my personal response to the EU referendum result, the consequent hysteria, expressed via political discourse and documented by the media, and my research collaboration with Palestinian choreographer Farah Saleh, leading to the dance commission Brexit means Brexit. 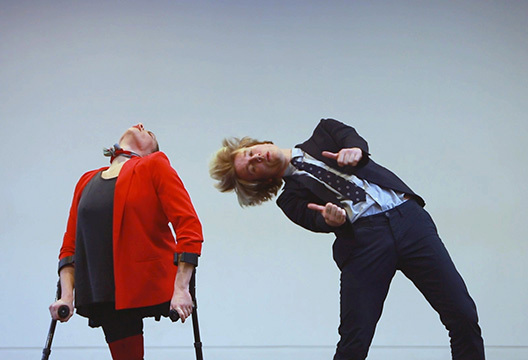 The dance piece explored our embodied, hysterical responses to the Brexit vote, focusing on how psychological sequelae may be expressed through physical gestures, evocative of a grieving process. The resulting performance premiered in London in March 2018 and toured to the Ramallah Dance festival (April 2018). See http://ps-y.org/projects/hysteria/ for more information." Find many more responses to Brexit in our archive.